I often refer to Rush Limbaugh as a 3 times divorced, draft dodger, drug addict and conservative leader. I thought would give an explanation on why I beleive Rush Limbaugh is a draft Dodger. Draft dodging is avoiding military service during time of war, or as I see it, not doing your duty when you’re country calls. This subject is near and dear to me because my grandfather served in WWII in the US Army and was wounded fighting the Japanese. My father also did 4 combat tours in Vietnam in the Marines and barely left with his life at a place called Khe Sahn. I am also a vet and did my time in the US Army during the first Gulf War. 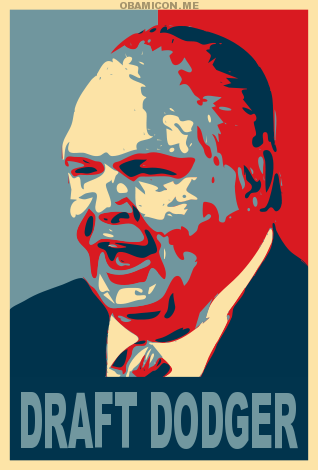 What was the All-American Patriot Rush Limbaugh doing during the Vietnam War ? From the evidence, it seems as if he was trying to find a way to get out of duty in Vietnam. Rush sought and received a college deferment and when he lost that he got a medical deferment for service from a private doctor. I guess it didn’t hurt either that Rush Limbaugh came from a rich prominent family of lawyers and politicians. 58,148 service members died in Vietnam. 17,725 were draftees. I’m sure there were many of these service members that didn’t want to be there. I don’t think they planned on dying either. I hope Rush Limbaugh and the people that consider him some kind of Patriot realize what he truly is. Freedom isn’t free and when Rush avoided being drafted, he may have allowed another man to go and make the sacrifice for freedom in his place. I would consider that cowardly in the least. Rush can’t do live TV because he actually has to deal with real people that aren’t filtered through his producers and can’t be silenced with the push of a button. In this, video Rush gets pwned by a crowd of average Americans and in the end has to resort to ending the show and pontificating behind a microphone as usual. Once again Tara Servatius and WBT-1110 Hate Radio have reached a new low. Tara Servatius and the Klan over at WBT are trying to claim that the reason the Republicans lost the mayors race and now lag behind on the city council 8 to 3 is because black people are racists. It couldn’t simply be because the Democrats were much more organized and that the Republicans didn’t turn out. During her shows on Wednesday and Thursday she used the words black and white approximately 50 times. She had the audacity to try and say that ALL of the Black Voters in Charlotte are racists because they didn’t vote for a White Republican. Tara went to a private school and went to an expensive college and got an expensive journalism degree but obviously she didn’t learn much. Maybe its time she get an education about what happens when you spread hate and lies about people you know little about. She is a sad individual and doesn’t represent our fine city. I have been listening to WBT for over 12 years and have never heard a more repulsive racist rampage as I heard in the past 2 days. It is time to rethink a strategy against this type of broadcasting and it is definitely time for WBT-1110 to go. WBT-1110 has worn out its welcome in Charlotte. It is time to move on and stamp out racism once and for all in Charlotte. It will take all of us working together, but it can be done. The 3 times divorced, draft dodging, drug addict and Viagra using single christian Rush Limbaugh gets called PWND on not serving in the military, torture, sour grapes, getting people to vote for Hillary and much more. Its well worth a view. There isn’t much of an target audience over at WBT-1110 if you look at the different groups of people they spew hate against. Today WBT’s newest Hate Radio Host Tara Servatius was railing against health benefits for Gay and Lesbian Couples employed by our local government. It seems Tara Servatius is promoting the redneck philosophy that straight people are better than gay people and therefore its okay to discriminate against them. I’m sure the other Hate Radio Host Keith Larson will be upset that Tara stole his thunder today. There is hardly a day that goes by that Keith Larson isn’t hateful towards the gay community. Whats even worse is there are people that actually pay Tara and Kieth to spread this kind of anti American trash. I no longer consider WBT a radio station, lets just call it what it is, a daily KKK rally. Perhaps WBT has forgotten that 61.83% of the people in Mecklenburg County Voted for Barack Obama and 61.59% of the people voted for Kay Hagan. Perhaps when the people at WBT are being hateful towards immigrants, democrats, gay people and Muslims they may want to consider how small their audience is actually getting. It is more than obvious where WBT is heading and I won’t miss it when they are out of business. Charlotte deserves much better and somebody will fill the void with decent programming. A librarian shows up at a public John McCain Rally on city property and is promptly issued a citation for trespassing by police and is escorted off the premises for simply carrying a sign that says “McCain = Bush”. Who says John McCain doesn’t support the right to free speech ? If your television declares John McCain the president elect on the evening of November 4th, your television will be lying. You should immediately pick up your pre-packed bags and head straight to the White House in Washington, D.C., which we will surround and shut down until this attempt at a third illegitimate presidency is reversed. A McCain “win” will not be illegitimate because I disagree with his policies, but because he himself has rendered it illegitimate. He and his campaign and allied supporters have sought to illegally remove hundreds of thousands of voters from the rolls, fraudulently registered people as Republicans without their knowledge and against their will, obstructed voter registration drives, falsely warned students against voting where they attend school, falsely accused community groups of voter registration fraud, falsely alleged the widespread existence of voter fraud, and encouraged supporters to falsely believe McCain’s opponent is a foreign terrorist through speeches, recorded phone messages, and flyers. Already in early voting in a number of states there have been cases of votes on electronic machines visibly flipping to McCain or McKinney when intended for Obama. We will see McCain supporters on November 4th challenging people’s right to vote, seeking to force people to vote on provisional ballots, and seeking to have provisional ballots discarded. And we will see electronic vote counts wildly out of step with the most recent polls, although not with exit polls — which we will be denied any access to unless they have been “adjusted” to match the official counts. Inciting your supporters to violence with racist and religious lies about your opponent, effectively alleging treason on absolutely no basis, should be enough, alone, to disqualify a campaign for the presidency of the United States. Working to block voters from registering should be enough on its own. Any of the dozens of creative forms of vote suppression currently being used by the Republicans should be enough. And allowing votes to be counted on completely unverifiable machines owned and controlled by corporations allied with your party should make the results illegitimate even if plausible. If McCain is declared the “winner,” it will not be plausible, but at this point he has so disgraced himself and our electoral system that he is no longer a legitimate candidate for president regardless of what the polls (themselves fallible, but all we’ve got) say just before election day. Too many people have already been denied the opportunity to even push the buttons and have their votes miscounted. Too much incendiary slander has been let loose. Too much visible vote flipping has already been documented. If Obama officially wins, McCain is likely to challenge it, charging the Obama campaign with some of the very crimes engaged in by McCain himself. Our reaction should be exactly the same in the event of a McCain challenge as in the event of a McCain “victory.” We should not sit back for even a split second and wonder how it will work out. We should not try to organize a plan on the spur of the moment to travel to key battleground states. We should be prepared already to immediately travel to Washington, D.C., head straight for the White House, occupy Lafayette Square Park, the Ellipse, and surrounding streets, block entrances, and shut the place down until Obama is recognized as the president elect or we are guaranteed a credible election with universal registration and hand-counted paper ballots. We may be there for days or weeks or months. But we must be there. We must be there by the millions. We must show each other, and the nation, and the world that we have had enough, that we will not stand for one more stolen election, that we will not give in to fear, lies, theft, and intimidation. If they choose to attack our nonviolent gathering of citizens, let them do it right in front of George W. Bush’s White House with the world’s media watching. We will not back down. I’m not hoping it comes to this, of course. If it doesn’t because the official election results are credible and just, we should celebrate and prepare to lobby our government for real change. But if resistance does not develop because people are too scared and obedient to act, then you’ll still be glad you packed ahead of time, and you might want to look into tickets to Canada.